An experienced plastic injection molder can help you select the correctly sized machine for your project, and will be able to provide you with an accurate size estimate right from the start based on a few key pieces of information. Presses are rated, or classified, based on tonnage, which indicates how much clamping pressure a particular machine can offer. Press tonnage, or force, can range from less than 5 tons to over 4,000 tons. The higher a machines tonnage is rated, the larger it is. 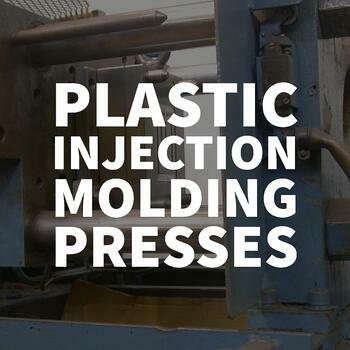 Many plastic injection molders provide a list of molding equipment used in their facilities on their websites, along with each machines’ tonnage capabilities. How Much Clamping Force Do I Need? Press rating — A machine with a 68-ton rating, for instance, will be able to deliver 68 tons of clamping pressure, or force. Material choice and MFI — The melt flow index (MFI) of plastic, or melt flow rate (MFR), indicates the ease of flow of a molten plastic material. A high MFI will require more pressure than a low MFI. Size — The size of the part will naturally affect the size of the machine needed. Many calculations include platen size in addition to mold and part size. Safety factor — A numerical percentage incorporated into size calculations to help avoid defects in the final part, the safety factor acts as a buffer; some experts recommend adding 10% to the overall press size estimate. For most projects, we recommend calculating required machine size using 2.5 times the surface square inches of the part and incorporating the 10% safety factor. So for example, a part with 42 square inches would need a press size with 105 tons of pressure. If you add 10% for a safety factor, you will need to use a press with a minimum of 115 tons of clamping force. 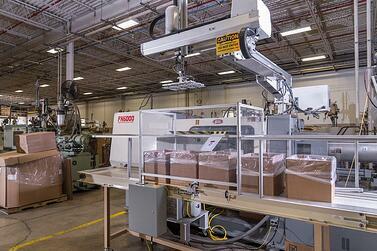 A press size of 120 tons would be able to accommodate this plastic injection molded product. Once you have an accurate press size estimate, you can start looking for a manufacturer; generally, molders with a variety of press sizes at their disposal will be able to accommodate a wider range of project requirements. And if your project doesn’t have a completed mold from the start, it’s best to work with a company that excels at injection molding design and building a mold based on exact specifications; this will help ensure efficient, seamless operations and secure communication among all external and internal team members. At The Rodon Group, our 125,000-square-foot manufacturing plant is home to 117 state-of-the-art injection molding presses, all highly automated, fully robotic, and microprocessor-controlled for industry-leading quality and precision.